If you asked my family and friends to list my strengths I guarantee that baking will not be in that list. My Mom used to bake every Sunday when I lived at home, I used to love the smell of the house on a Sunday. She would make an apple pie to have after the roast that day and then a yummy cake for Dad & I to take in our lunchboxes to school and work in the week. I really wanted to be able to bake like my Mum but I’m afraid it hasn’t come naturally to me. Still, practice makes perfect and for the last couple of Sundays I have been trying to bake with Little Man. The first week was a disaster, cookie mix everywhere and no cookies at the end of it! This Sunday was a little more successful with yummy treats at the end of our baking adventure. I have to admit something though, I didn’t actually bake – nothing went near an oven. 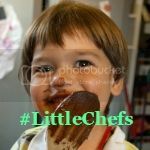 We made chocolate cornflake cakes and Little Man loved it as did G & I as they reminded us of school dinners – yum. I won’t share a specific recipie with you as there are many many online and I don’t think you even need a recipe for these. Well only people like me do anyway. But we basically melted a load of chocolate, butter and honey, mixed it into some cornflakes and put them in the fridge. Job done. I have to say although this is an incredibly simple recipe, it is great for toddlers. Little Man loved mixing it all together and a particular highlight was licking the spoon of course. Maybe we’ll progress to fairy cakes next week, watch out kitchen surfaces!! I must apologise for the not so great photos, this was all done in a bit of rush in the end. I have not learnt about preparation yet it seems. Ooh reminded me not made these in ages!!! We have to make more now as I have a lot of cornflakes left 😉 Thanks for commenting. Mmm they look so good! I never think to add honey and butter to the melted chocolate. Will have to try that next time! The honey made them very sweet but extra yummy! I know cornflake cakes are supposed to be for children but I love them (I’ve even been known to buy one in Costa with my cappuccino!). My boys were making cupcakes at the weekend and I put the recipe on my blog if you’re thinking of making some. One of our favourite no-bake bakes, is Marshmallow Crispies. It uses rice crispies, marshmallows, toffees and butter and is delicious! (the full recipe and instructions in on my blog). Perfect for toddlers. Ohh I shall head over and have a look, they sound delicious! Thanks for commenting.